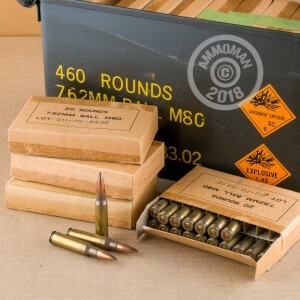 This bulk pack of 7.62x51mm ammunition includes 460 rounds for training, plinking, and target practice along with a nifty storage container which will serve you well long after the ammo has been shot up and the reloadable brass casings collected. 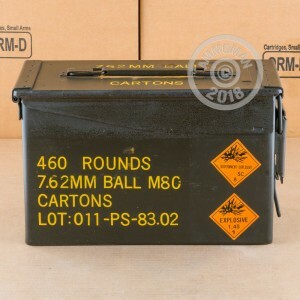 The steel box that the ammo comes in follows the NATO standard for .50 Caliber ammunition cans and sturdy construction, stackability, and a removable lid. A folding carry handle is attached to the top of the lid for convenient carry while a rubber gasket lines the inside in order to protect the ammunition from moisture. 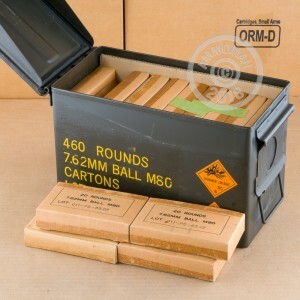 The ammo itself was manufactured by PMC, Korea's sole military and commercial ammunition supplier. PMC creates ammunition using in-house components and proper quality-assurance techniques including proper heat treatment of their brass. Each brass case wears a non-corrosive Boxer primer at its base which is packed with water-repelling sealant; this prevents humid environments from ruining the ammo over time. Atop each 7.62x51mm round is a full metal jacket (FMJ) projectile which will feed well in bolt-action rifles as well as semi-automatics whether they were produced decades ago or freshly debuted at this year's SHOT Show. Each FMJ weighs in at 146 grains which is very close to the M80 standard used in training and combat by United States military forces and will match many available scope reticles and zeroing tables. 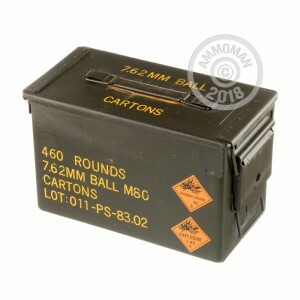 Inside the steel can, the ammo comes packaged 20 rounds per cardboard sleeve for casual piecemeal use at the range. Beautiful product. Clean, excellent ammo. Very clean ammo. Looks almost brand new.